Along the journey, some cool things have been planned, and other more unexpected things have happened. This section is a record of notable moments in time for Squatties. 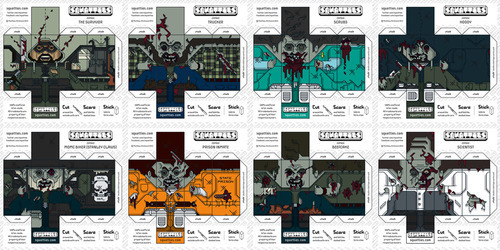 For Halloween 2013 I extended the existing range of zombie characters. I also began work on the second diorama scene in Cinema4d. I was so pleased with the resulting image that I submitted it to The West Of England Design Forum's 5-9 book; a showcase of personal art and design created outside of the paid 9-5 job. 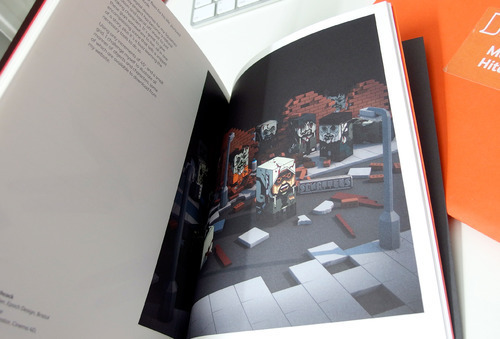 The limited edition book launched on the 5th of December 2013. Digital Arts recently did a piece on the book project so you can now easily see more from the book over at their website. In the Summer of 2012 my Banksy Squattie became (a very small) part of the UK’s largest permanent street art project See No Evil in Bristol, at the Long Playa art installation (and subsequent charity auction). 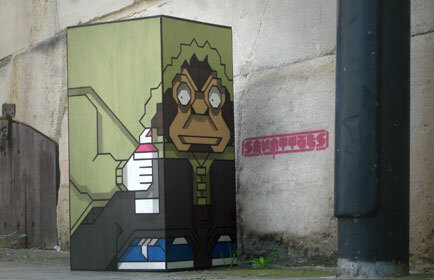 My original piece, a 2 meter tall character never quite got finished, and got a bit batterred in transit, so I made a plywood replica, which turned out to be a lot more manageable size. It sold for £325, and all the money went to local charities 'Knowle West Media Centre' and the 'Trinity Community Arts' centre. I'm still awaiting the good-karma return on that one. Here is a nice blog post about the auction. Scroobius Pip saw his Squattie and gave it a mention on his official Facebook page. Okay, as a brief break from em suggesting you come get drunk with me on Friday night (at the Book Club, Shoreditch) I thought you may instead like to download me (for FREE), cut me out, and keep me! These are amazing!. B. Dolan liked his Squattie so much he put him up on his website bdolan.net/ as a special #FanFriday present. Thanks to the folks at Squatties.com, B. Dolan has been immortalized in paper and glue, where (after some very minimal cutting and assembling) he will glare at you from your desk or bookshelf 24/7. The kind folks over at Aardman caught wind of the Wallace & Gromit Squatties I made in July 2012 and gave me a mention on their official: Facebook page. 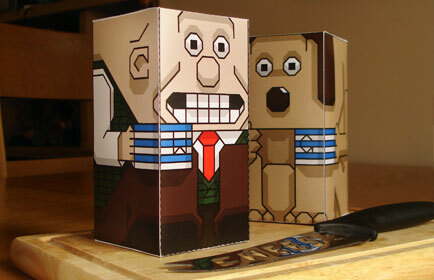 We really like these cracking paper toys made by Squatties! You can even download them if you’d like to have a go at making your own!. Blog article link and what they blogged about. THE DARK KNIGHT RISES Movie - BATMAN and BANE Squatties Paper Toys!